From an early age little boys are all about playing with toy trucks and wishing they were behind the wheel. Well, in honor of this young automotive enthusiasm we’ve decided to create a fantasy team of trucks – 10 amazing trucks that every kid wishes they had. While there have been many imitators across the years, there is only one Bigfoot. Credited with being the original monster truck in the sport, the very first Bigfoot is a 1975 Ford F-150 that has been listed by Hot Rod magazine as one of 100 “most influential vehicles” in all of history. While any child might be in awe at the size of the original Bigfoot, they would be downright traumatized by the mass of the Terex 33-19 Titan. Considered to be one of the biggest trucks in the world, this behemoth is nearly 67 feet long, 26 feet wide and 23 feet high. Just look at the women standing next to it, it is bigger than life and definitely a truck that any kid would swoon over. 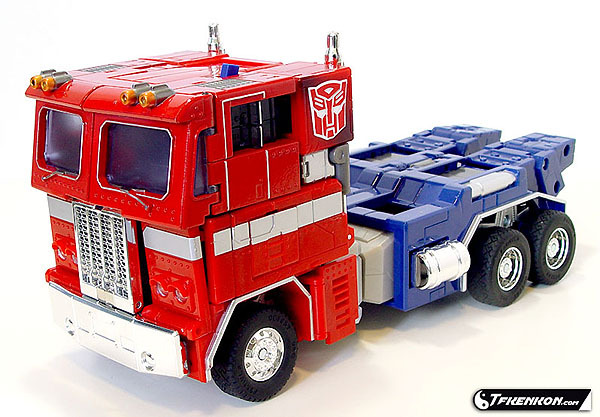 Probably the most recognizable character in the entire transformer franchise, Optimus Prime is a Mack truck that is more than meets the eye. A class-8 Freightliner cab-over-engine by day and the all-wise leader of the Autobots by night, what kid wouldn’t want to drive Optimus Prime? On an episode of “Pimp my Ride” a lucky dude named Mike gets his 1978 bread truck converted into a modern day entertainment system on wheels that any kid would die to have. Although there is no picture that really does this converted bread truck justice, it now has 22” chrome rims, plasma TV with PS2, 26 individual MTX Audio speakers that pump out 24,000 watts of power, 22” Jackhammer speakers that are as loud as a fighter jet and, as you can see, a fold out skateboarding ramp as the cherry on top. In the end, the famed sports car on Knight Rider (K.I.T.T.) does not make it very far without its mobile garage and headquarters, the F.L.A.G. Mobile Unit. An acronym for the Foundation for Law and Government, F.L.A.G. was an underappreciated semi-trailer truck that was a workhorse for the flashier K.I.T.T. and, therefore, deserving of a spot on this esteemed list. Do not judge this truck by the video thumbnail, the video has to be seen to believed! What appears to be your average 2005 Chevy Silverado 2500 HD, is actually a mobile bar and grill for the ultimate tailgating experience. With seven TV screens, a satellite dish, two receivers, MTX Audio, a refrigerated center console and total custom interior, you don’t have to be an adult to enjoy this – just watch the kid running around to prove that. Going green with your automobile just got a whole lot more street cred with this F-450 Super Duty Biodiesel B100 Hydrogen Hybrid. Customized by Galpin Auto Sports (GAS) in Van Nuys, CA, this eco-beast has 4-captain’s chairs, video monitors mounted in the front and rear, DVD player, 8-inch JL Audio W7 subwoofers and two HD amps kicking out 1600 watts of power and yet still boasts 500hp and 800 lb-ft of torque. Now, does that sound like a hybrid? Most kids would die to be able to drive an average stock Hummer but this tricked out Hummer from the 2008 SEMA show in Las Vegas is a whole new breed of fantasy truck. Sure, the paint job looks great and all but look at those wheels – more like tank treads that can likely climb anything in its path! 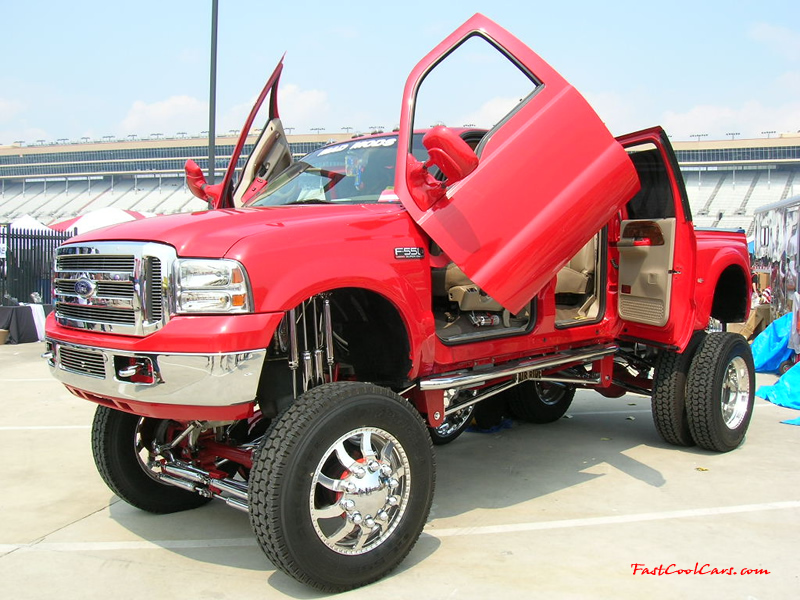 While the original Bigfoot is just a Ford F-150, here’s a monstrous “Big Red” Ford F-550 dream truck from the future! With all kinds of flashy add-ons, lifts, butterfly doors and chrome rims that might make any kid pass up the humble O.G. for some bright and shiny bling. Speaking of Big Red, let’s back away from fame and fancy for a second and get real. At the very forefront of any child’s romance with trucks, sits your every day fire engine. Yes, there are fancier trucks with more power in existence, but there is something timeless and heroic about a classic fire truck that is truly unparalleled. 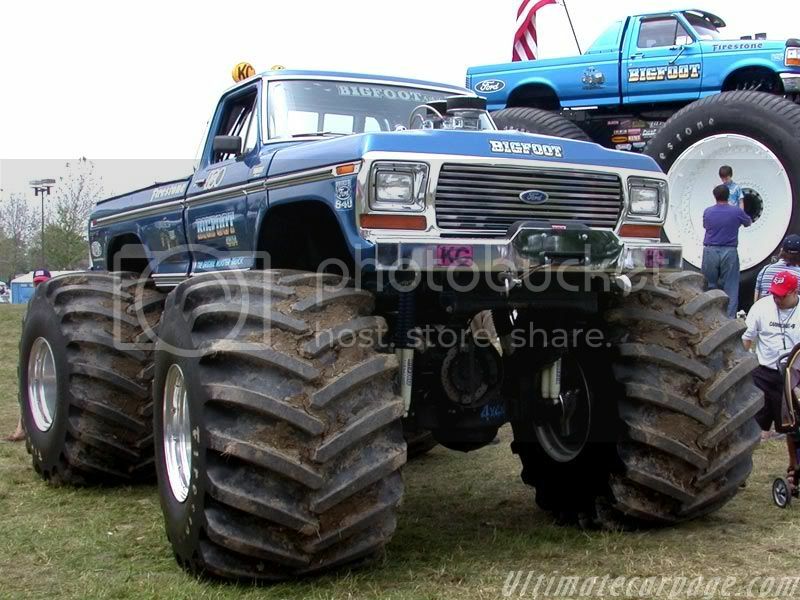 We hope you’ve enjoyed this gallery of dream trucks. Although they all offer different perks for different tastes, it’s safe to say that any kid, or adult, would be more than happy to own one of these!